IUJ is located about 230 kilometers northwest of Tokyo. The nearest town is Urasa and it takes about 1 hour and 40 minutes to get to Urasa from Tokyo by the Joetsu-Shinkansen or Bullet train. The Joetsu-Shinkansen and the Kan’etsu Expressways provide easy access to Tokyo and Niigata City. Free shuttle-bus service connects IUJ with the town and the Urasa railway station. Take a Toki SuperExpress to “Urasa” station about 90 min. from Tokyo station, and 40 min. from Niigata station. 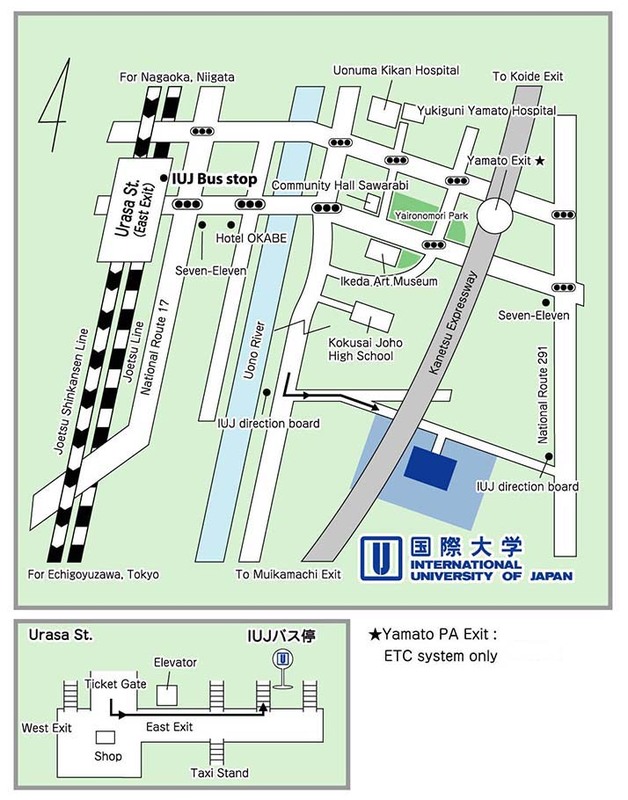 IUJ is ten minutes from “Urasa” station (East Exit) by IUJ shuttle bus*. *Please turn left (East Exit) after the ticket gate (only one in the station). Go down the second stairwell to the left. You will find the IUJ bus stop. The IUJ shuttle bus is available from about 8 am to about 8 pm (once an hour) from Monday to Friday (Special schedule for Saturday and Sunday). Take either “Muikamachi” Exit or “Koide” Exit (about 3.5 hours from Tokyo /about one hour and half from Niigata city), and then follow Route 17 to Urasa Station and IUJ (about 15 min.). ★ About 10 min. from Yamato PA Exit (ETC system only). The IUJ campus is situated in a beautiful valley surrounded by magnificent Echigo-sanzan mountains. The local area offers rich traditions of rural community and outdoor opportunities throughout the year; mountain climbing, hiking, skiing, hot springs and many more. The climate is seasonal. The autumns are pleasant and clear, with average temperatures in the 50-60 F (10-15 C) range. During the winter, temperatures hover around freezing, producing heavy accumulations of snow. Spring weather is sunny and variable with temperatures in the 60-70 F (15-21 C) range. In sum, the campus location is in an attractive, rural setting that offers many opportunities to experience the cultural environment of Japan and the beautiful outdoors.